EAST BAY BOOKSELLERS welcomes Elena Schneider and Caitlin Rosenthal to discuss their new new books The Occupation of Havana and Accounting for Slavery, on Friday, February 1st at 7pm. The Occupation of Havana offers a nuanced and poignantly human account of the British capture and Spanish recovery of this coveted Caribbean city. 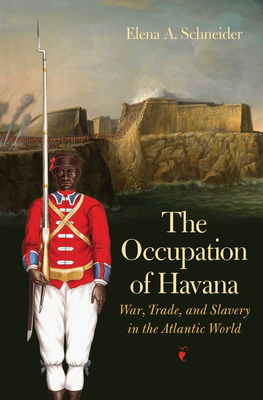 The book explores both the interconnected histories of the British and Spanish empires and the crucial role played by free people of color and the enslaved in the creation and defense of Havana. Tragically, these men and women would watch their promise of freedom and greater rights vanish in the face of massive slave importation and increased sugar production upon Cuba's return to Spanish rule. By linking imperial negotiations with events in Cuba and their consequences, Elena Schneider sheds new light on the relationship between slavery and empire at the dawn of the Age of Revolutions. Accounting for Slavery is a unique contribution to the decades-long effort to understand New World slavery's complex relationship with capitalism. Through careful analysis of plantation records, Caitlin Rosenthal explores the development of quantitative management practices on West Indian and Southern plantations. She shows how planter-capitalists built sophisticated organizational structures and even practiced an early form of scientific management. They subjected enslaved people to experiments, such as allocating and reallocating labor from crop to crop, planning meals and lodging, and carefully recording daily productivity. The incentive strategies they crafted offered rewards but also threatened brutal punishment. Elena Schneider is a historian of Latin America and the Atlantic World. Her teaching focuses on Cuba and the Caribbean, comparative colonialism and slavery, and the Black Atlantic. Professor Schneider's research explores the ways that war, trade, and slavery integrated the Atlantic world across regional and what would later become national boundaries. Caitlin Rosenthal is a historian of 18th and 19th century U.S. history. Her research focuses on the development of management practices, especially those based on data analysis. She seeks to blend qualitative and quantitative methods and to combine insights from business history, economic history, and labor history. Before coming to Berkeley, she was the Newcomen Postdoctoral Fellow at Harvard Business School, and before that she worked as a consultant with McKinsey & Company. Her work is motivated by the hope that more complete histories of management can help us to explore deep political and ethical questions, many of which continue to face modern businesspeople.